Mary was born to be the mother of the Savior of the world, the spiritual mother of all men, and the holiest of God's creatures. Because of her Son's infinite merits, she was conceived and born immaculate and full of grace. Through her, Queen of heaven and of earth, all grace is given to men. Through her, by the will of the Trinity, the unbelieving receive the gift of faith; the afflicted are tendered the works of mercy; and the members of Christ grow in likeness of their Head. In Mary all human nature is exalted. We rejoice in her birthday, as the Church has done from the earliest times. 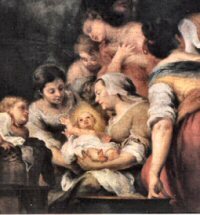 This is one of the three birthdays in the Church Calendar — the Birth of Jesus (December 25), the Birth of John the Baptist (June 24) and the Birthday of Mary. All three were born without original sin, although Mary and Jesus were conceived without sin, and St. John was cleansed of original sin while in the womb at the Visitation of Mary. According to the 1962 Missal of St. John XXIII Extraordinary Form of the Roman Rite, today also commemorates St. Adrian. The liturgy of Our Lady's Birthday in Rome included a procession from the church of St. Adrian in the forum. St. Adrian was a Herculian Guard of the Roman Emperor Galerius Maximian. After becoming a convert to Christianity with his wife Natalia, Adrian was martyred at Nicomedia on March 4, 306. Historically it is the feast of St. Corbinian, a Frank who spent fourteen years as a hermit and then went to Rome, where Pope Gregory II consecrated him bishop and sent him to evangelize Germany. On Our Lady's birthday the Church celebrates the first dawning of redemption with the appearance in the world of the Savior's mother, Mary. The Blessed Virgin occupies a unique place in the history of salvation, and she has the highest mission ever commended to any creature. We rejoice that the Mother of God is our Mother, too. Let us often call upon the Blessed Virgin as "Cause of our joy", one of the most beautiful titles in her litany. Since September 8 marks the end of summer and beginning of fall, this day has many thanksgiving celebrations and customs attached to it. In the older form of the Roman Ritual there is a blessing of the summer harvest and fall planting seeds for this day. The winegrowers in France called this feast "Our Lady of the Grape Harvest." The best grapes are brought to the local church to be blessed and then some bunches are attached to hands of the statue of Mary. A festive meal which includes the new grapes is part of this day. Patron: All people named Mary, in any form. Symbols: bruised serpent, sometimes encircling a globe; the lily; fleur de lis; virgin's monogram; pierced heart; crescent moon; sun and moon; starry crown; Mater Dei; rose; flowering almond; gilly flower; snow drop; hawthorn; the star; the balsam; the Ark of the Covenant; the mirror or speculum; apple; myrtle; palm, cypress and olive; closed gate; book of Wisdom; sealed book; rod of Jesse; lily of the valley; house of gold; city of God; vessel of honor; seat of wisdom. Learn prayers to Mary, such as the Angelus, Litany of Loreto, Memorare, Hail Mary, and Hail Holy Queen. Learn and sing various hymns to Mary, such as the Salve Regina, Immaculate Mary, Hail Holy Queen. See top bar for list of suggested hymns. Start researching and planning a Mary Garden, or a special plant or flower for each feast day of Mary. This can be for next spring, but if some bulbs are to be included, this is the time to plant them! Contemplate on how all the feasts of Mary point to the mysteries of Christ and our salvation history. Biblical readings: Proverbs 8:22-35 and Matthew 1:1-16 (this points to the appreciation of the heritage and family of Jesus). Have a birthday party for Mary, with a specially decorated birthday cake and birthday decorations. Blue is the traditional color of Mary's mantle, so incorporating blue into the decor and food is quite appropriate. Try making an all white cake symbolizing Mary's purity, or cookies with white icing. White meringue cookies (or kisses) would also remind one of Mary's sinlessness. Birthday parties don't need special explanations for children. Have each child present a "gift" to their Mother Mary, such as spiritual bouquets, faults or virtues to work on, corporal works of mercy, etc. Learn to make string knot rosaries to give as "favors." Decorate the house, family table or family altar with flowers or special Marian decor. Eat some form of blueberries on this day, particularly in the morning -- blueberry muffins or blueberry pancakes, blueberry pie or just fresh blueberries on your cereal. The blue is symbolic of Mary's blue mantle. Find out about the devotion to "Maria Bambina" or "Baby Mary." Women for Faith and Family have some wonderful ideas for this feastday. While presiding over the torture of a band of Christians, St. Adrian asked them what reward they expected to receive from God. They replied, "Eye hath not seen, nor ear heard, neither have entered into the heart of man, the things which God hath prepared for them that love him". He was so amazed at their courage that he publicly confessed his faith, though he had not himself yet been baptised. He was then imprisoned himself. He was forbidden visitors, but accounts state that his wife Natalia came to visit him dressed as a boy to ask for his prayers when he entered Heaven. The next day his limbs were struck off on an anvil, and he was then beheaded, dying in the arms of Natalia. After he was killed, Adrian and several other martyrs were taken to be burned. When the executioners began to burn their bodies, a thunderstorm arose and the furnace was extinguished; lightning killed several of the executioners. Natalia had to be restrained to not throw herself on the fire when Adrian's body was being burned. Christians took Adrian's body and buried him on the outskirts of Byzantium, at Argyropolis. Natalia went to live there herself, taking one of Adrian's hands which she had recovered. When she herself died, she was buried with the martyrs. St. Adrian was the chief military saint of Northern Europe for many ages, second only to St. George, and is much revered in Flanders, Germany and the north of France. Patron: Plague, epilepsy, arms dealers, butchers, guards, soldiers. Symbols: Depicted armed with an anvil in his hands or at his feet. Read this account of St. Adrian in the Golden Legend and visit this website. 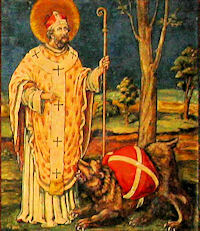 Though St. Corbinian was a great Apostle of Bavaria, he was a native of Chatres, in France. He lived alone in a cell close to a chapel for fourteen years. He was sought out for spiritual counsel, and the occurrence of miracles made his holiness further known. Various people desired to form a community with him as their superior, but the disruption in his life caused by the duties that this undertaking required made him decide to go to Rome. A tradition relates that on his way there, after a bear killed his pack horse, he had his servant place his pack on the back of the bear and proceeded with it to the Eternal City. At some point, St. Corbinian was made a bishop, and Pope St. Gregory II sent him to Bavaria. In Freising, he preached with great success. St. Corbinian had been protected by Duke Grimoald, but when the Duke disobeyed Church law and married the widow of his brother without a dispensation, Corbinian condemned the union. The widow, Biltrudis, plotted to have Corbinian killed, but he fled to Meran. Eventually the Duke died in battle. Corbinian was originally buried at a monastery he had founded in Meran, but his body was later moved to Freising. Patron: Freising, Germany; Archdiocese of Munich, Germany. Symbols: Bear, bishop making a bear carry his luggage; bishop with a bear and mule.